High-quality, durable, and affordable products from your trusted deck builder in East Texas. Ask About Our Decks For Sale In East Texas. A quality deck shouldn’t have to cost an arm and a leg. At Ready Decks in East Texas, we believe that homeowners should be able to enjoy a premium deck without paying a premium price. The difference at Ready Decks is our pairing of the best materials in the industry with our patent-pending building system. Reach out to us today and we’ll discuss our products with you further. At Ready Decks, we understand no two projects are the same. Rest assured that our team will walk you through your options and answer any questions you may have along the way. Learn more about some of the more popular Ready Decks products below. For nearly two decades, Ready Decks has been the leader in pre-priced, custom-fit decks. Not only do our decks look incredible, but they can also be built in as little as one day. Be sure to ask about customizable options from our selection of premium options and upgrades. Tired of the heat and storms forcing you indoors? With your own Ready Porch, you can enjoy comfortable access in and out of your home, regardless of what Mother Nature has in store. Every Ready Porch features treated beams, rafters, lathes, and premium metal roofing. A Gable Porch makes for the perfect front porch addition. This signature product can be built to match the existing gable on your home and includes all treated framing. Contact Ready Decks today and ask about a vinyl upgrade with this project. 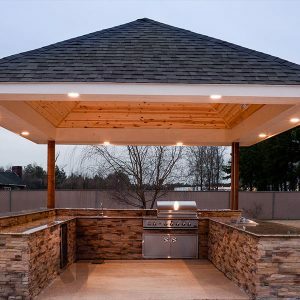 When it comes to decks for sale in East Texas, Ready Decks makes the process simple and stress-free. Don’t make the mistake of hiring just anyone to take on this home improvement project. Nobody builds more decks than our decking contractor.